A unique evening of soulful music and dance based on Krishna Consciousness was presented to mark Ashadhi Ekadashi in MAHAGAMI, Aurangabad, on 23 July 2018. 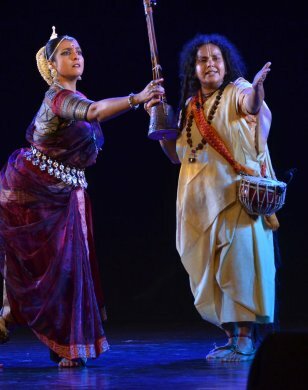 The program named 'Paraspar' meaning 'to mutually reciprocate' showcased a spontaneous artistic dialogue between two artists representing two art forms - Parvathy Baul (Baul Sangeet) and Parwati Dutta (Odissi Nritya). 'Paraspar' was a humble offering by the two devoted artists -an offering immersed with music, dance, divine words and thoughts. The artistes dwelt in their own spaces while engaging in a subtle dialogue within, amongst them and beyond. We know that the Bauls are mystic minstrels (Muslim Sufis and Hindu Vaishnavs) from the Bengal region, who traveled and sang in search of the internal ideal. Odissi considered one of the oldest classical dances of India with its first reference in Bharatamuni's Natyashastra as 'Odra-Magadhi', was a dance offering in the temples of the medieval period. This mutual dialogue of the two traditions through the two artists brought forth the pious and sacred stream of bhakti and submission. 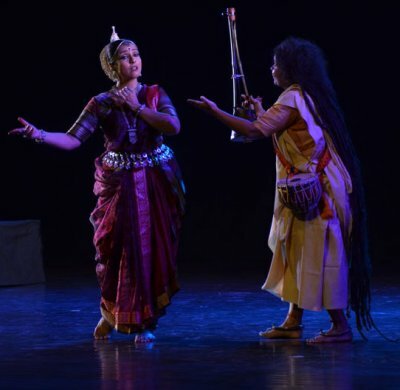 The program was in three parts; the first part had Odissi performance by Parwati Dutta, second part was Baul Sangeet by Parvathy Baul and the third brought both artists together in an artistic dialogue. Beginning with an imaginative Jagannath Ashtakam in praise of Lord Jagannath, one of the forms of Krishna, Parwati Dutta moved on to Dashavatar showing the 10 incarnations of Lord Krishna by exploring the stage interestingly assigning different zones to different characters and avataras. This was followed by an involved abhinaya to an ashtapadi "Pashyati dishi dishi ...." from Jayadeva's Geeta Govindam. Dutta portrayed the virahotkanthita nayika through her contained yet intense abhinaya. The sancharis unfolded many layers and narratives along the central line. Sarpa Janana was a rare piece composed by Parwati Dutta which is a 'Ninda stuti' by Kavisurya Baladev Rath. This invocation of lord Jagannath as a snake began with depiction of a story where a bhakta is bitten by the snake in the temple premises. The lord is evoked with a feeling of agony and anger. The Odissi performance by Parwati Dutta concluded with a soulful rendition to Bengali song by Tagore on the eternal melody of flute laced with a lyrical Krishna Tandav that showcased the omnipresent Krishna. In the next part, Parvathy Baul entered with her ektara and duggi singing with complete surrender of devotee to Krishna as Guru. The devotee says to Krishna, "While the whole world praises you, it accuses me of loving you. I take all those accusations as ornaments, while I rest only in you." The following song was about Ananda. It spoke about sadhak's journey to the city of joy (anand), which is above physical mind and physical body, yet within this body. Traversing the physical space and the sound space, Parvathy immersed one and all in her divine submission. Her next song about Kaali Krishna was a rare imaginative piece. Here, devotee is asking Kali to let go her fierce appearance, and stand in tribhanga like Krishna with Radha beside her; essentially praying to mother Kaali to take the bhava of Krishna. Her gentle and sublime dance moves punctuated by tinkling sounds of the nupura along with her singing on ektara created a mystic aura that left the audience immersed in the music. 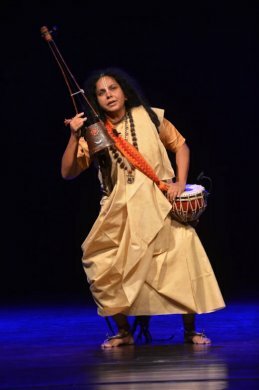 Paraspar - The name of the presentation interestingly included the initial letters of both artists' names - Parvathy Baul and Parwati Dutta who came together in the energised artistic dialogue. Stories of Radha and Krishna have been sung since 10th century in Bengal invoking unconditional love. In the chosen narrative from Baul tradition, Radha prepares to receive Krishna but the night passes and He doesn't come. In despair she decides she doesn't want to see him anymore and avoids seeing anything black that reminds of him. Krishna instead spends the night with Chandravali; he remembers his promise to Radha the next morning and tries to come back to meet her. Radha now refuses to meet him and deploys her sakhi Brinde to stop Krishna.Finally she agrees and says, Krishna is within and everywhere, so life cannot be without him, and Brinde brings Krishna saying that he has to become the bhakta to understand the love of a bhakta. The mutual dialogue along with dance, abhinaya, narration and rhythm sequences took the audience towards an emotional journey interspersed with narratives of Radha, Krishna and Brinde. The impromptu delineation by Parwati Dutta through abhinaya, rhythmic passages and cadences of movements after every section of the song-narrative of Parvathy Baul was a delight to watch. The mutual dialogue emerged as a discourse leading to the divine. Shivshankar on mardal, Manoj Desai on vocals, Hriday on sarod and Niranjan on flute provided a strong support. The presentation ended with chanting by Parvathy Baul of "Jay Jay Ram Krishna Hari" along with Parwati Dutta's internalized movements to the recitation of abstract utterances of Odissi dance. The Bhramari (spins) and Parikrama by the artists highlighted the crescendo of the performance finally merging together with a verse from Dnyaneshwari on the significance of the Guru.